Oral history and the importance of sharing at Pride in Washington D.C. 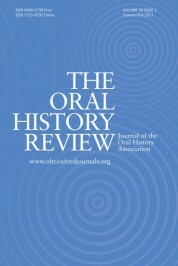 The Oral History Review, published by the Oral History Association, is the U.S. journal of record for the theory and practice of oral history. Its primary mission is to explore the nature and significance of oral history and advance understanding of the field among scholars, educators, practitioners, and the general public. Follow them on Twitter at @oralhistreview, like them on Facebook, add them to your circles on Google Plus, follow them on Tumblr, listen to them on Soundcloud, or follow their latest OUPblog posts via email or RSS to preview, learn, connect, discover, and study oral history. Back in March we heard from our friends at the Samuel Proctor Oral History Program (SPOHP) at the University of Florida, who had traveled to the Women’s March on Washington as part of an experiential learning project. Working with their colleagues at the UF Center for Gender, Sexualities, and Women’s Studies Research, they returned to Washington, D.C., in June to document the city’s Pride Weekend, including the Equality March for Unity and Pride, the QT Night of Healing and Resistance, and more. They have graciously shared some of the fruits of their labor with us below, including some reflections and a podcast put together by Aliya Miranda. Together they provide a taste of the experiences they had and the stories they recorded. Their reflections highlight the importance of sharing stories – how listening to each other can help to humanize “the other” through shared experiences and why thinking about our intersecting identities is critical for both good organizing and good oral history. Why have certain voices been silenced in the LGBTQ+ community? Why have trans folks and people of color not received full credit for the revolutionary ideas they have advanced? How do these messages numb cultural understandings of the LGBTQ+ experience? These are challenging but critical questions to be engaging with at a time when Pride events have become multi-million dollar events spanning multiple days. Our first night in Washington, D.C. was spent at an event hosted by the Trans Women of Color Collective, organized to create a space of healing and resistance. There we met two best friends who we shadowed for the duration of the weekend: Aurora, a Black trans woman, and Strawberry, a Black gay man who is HIV+. They serve as systems of support not only for each other but the community around them. After speaking with Aurora and Strawberry for some time, we came to understand the complex world of queer politics in the city. Pride has been divided over multiple weeks, each devoted to a particular identity. According to Aurora, there are Pride weekends devoted to Black communities, Latina/o communities, and so forth, all leading up to Capital Pride, the largest and arguably Whitest Pride event in the city. Aurora shared the problems she saw with this framework, but recognized how designated spaces are also important when pursuing solutions to social problems faced by that community. These conversations, and this reflection, have posed more questions than answers, but I want to use this space as an opportunity to consider the utility of identity politics. I believe it is possible to acknowledge our varying experiences while also working to demand justice together, but to say we’ve reached that point would be a mistake. Understanding how experiences can be unique, and viewing oppression as inextricably linked, is the first step in working toward a more unified LGBTQ+ community. Queer in the Capital 2017: Pride, Resistance, and Community from Drea Cornejo on Vimeo. “We met across a crowded dance floor.” While in D.C. for the 2017 Pride weekend, I briefly met the uncles of one of our program volunteers. The couple had met in 1994 at Gainesville’s sole LGBTQ+ nightclub, University Club, while they were both students at the University of Florida. Their meeting over twenty years ago brought special memories of my own life to mind while in the midst of this historic weekend. My best friend, Mireillee, and her partner gave me a rose quartz necklace as a Christmas present this past year. Believed to attract romantic love, their gift worked its magic in less than two weeks. Mireillee and I regularly encourage each other in our work lives, schoolwork, romantic pursuits, as well as sharing nights of barhopping and dancing—oftentimes leading us to the dance floor of that same University Club. In January, less than a week before I embarked with another research team to document the Women’s March on Washington, I met my first love and current partner across the crowded dance floor at the University Club. On Thanksgiving 2015, I shared the holiday with Mireillee’s family in her hometown of Orlando because my family was away, and she didn’t want me to spend that time alone. That evening we went gallivanting around Orlando, ending up at Southern Nights, an LGBTQ+ nightclub. Across a crowded dance floor, a woman and I goofily started smiling at each other. We found ourselves within a couple of feet of each other, and spent the rest of the night dancing together. We exchanged numbers, and we spent the next few weeks getting to know each other through broken English and Spanish. We reconnected a few weeks later and spent a weekend together, but eventually fell out of contact, and our lives continued separately. Six months after the horrific massacre in Orlando, I was at Pride with Mireillee in her healing hometown, and reconnected with my old dancing partner, reigniting our friendship. For more from the Samuel Proctor Oral History Program (SPOHP), find them on Facebook, Twitter, or their homepage. Chime into the discussion in the comments below or on Twitter, Facebook, Tumblr, or Google+. Featured image credit: “Marchers gather in front of the state capitol in Washington D.C. following the Equality March for Unity and Pride on June 11, 2017.” Photo Credit: Andrea Cornejo and the Samuel Proctor Oral History Program.